Banff (/ˈbæɱf/ or ) is a town within Banff National Park in Alberta, Canada. 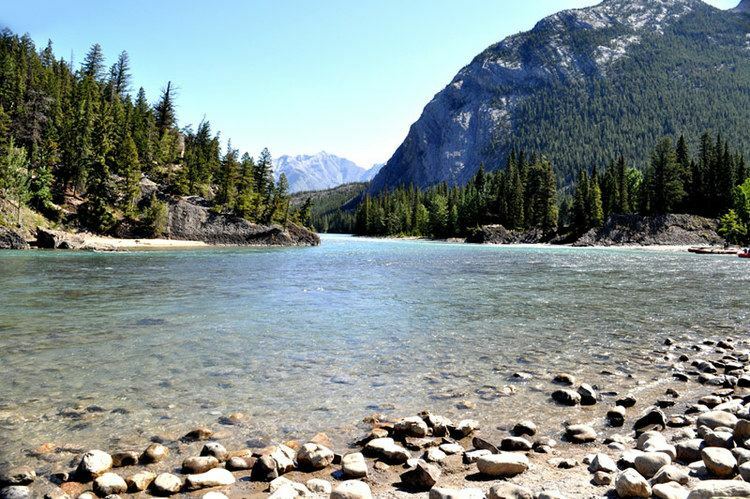 It is located in Alberta's Rockies along the Trans-Canada Highway, approximately 126 km (78 mi) west of Calgary and 58 km (36 mi) east of Lake Louise. At an elevation of 1,400 m (4,600 ft) to 1,630 m (5,350 ft), Banff is the community with the second highest elevation in Alberta after Lake Louise. Banff is a resort town and one of Canada's most popular tourist destinations. Known for its mountainous surroundings and hot springs, it is a destination for outdoor sports and features extensive hiking, biking, scrambling and skiing destinations within the area. Sunshine Village, Ski Norquay and Lake Louise Mountain Resort are the three nearby ski resorts located within the national park. Banff experiences a subarctic climate (Köppen climate classification Dfc) that borders on a humid continental climate (Köppen Dfb). Winter temperatures range from an average low of −13.3 °C (8.1 °F) to an average high of −0.2 °C (31.6 °F). Summer temperatures in the warmest month are pleasant with an average high of 21.6 °C (70.9 °F) and an average low of 7.3 °C (45.1 °F). Snow has been recorded in all months of the year. The annual snowfall averages 191.0 cm (75.2 in). In the 2016 Census of Population conducted by Statistics Canada, the Town of Banff recorded a population of 7,851 living in 2,543 of its 2,729 total private dwellings, a 3.5% change from its 2011 population of 7,584. With a land area of 4.77 km2 (1.84 sq mi), it had a population density of 1,645.9/km2 (4,262.9/sq mi) in 2016. The population of the Town of Banff according to its 2014 municipal census is 8,421, a 16.1% change from its 2011 municipal census population of 7,251. This does not include the town's shadow population (non-permanent residents). In addition to 8,421 permanent residents, the municipal census counted 965 non-permanent residents for a combined population of 9,386. Parks Canada enforces requirements that individuals must meet in order to reside in the town, in order "to ensure that a broad supply of housing types are available for those who work and raise families in the community". In the 2011 Census, the Town of Banff had a population of 7,584 living in 2,565 of its 2,850 total dwellings, a 13.2% change from its 2006 population of 6,700. With a land area of 4.88 km2 (1.88 sq mi), it had a population density of 1,554.1/km2 (4,025.1/sq mi) in 2011. Tunnel Mountain (formerly known as Sleeping Buffalo Mountain) (1,690 m or 5,545 ft) is situated within the townsite and is very popular for quick hikes; one can reach the summit in less than half an hour. It was named Tunnel Mountain because surveyors initially wanted to make a tunnel for the Canadian Pacific Railway right through the mountain, instead of following the Bow River Valley. In June 2008, the Banff council launched a local bus system called Roam, with three routes connecting the town, Tunnel Mountain, the Banff Springs Hotel, and the Banff Gondola. The service is operated using four hybrid Nova buses, each decorated with scenes from the National Park. There are three separate routes: • Route 1 which goes to Sulphur Mountain • Route 2 which goes to Tunnel Mountain • Route 3 which goes from Banff, to nearby Canmore. Many bus stops along the routes have screens which tell exactly how many minutes before the next two buses arrive. In December 2012, the bus system was expanded to include the Route 3 hourly service between Banff and Canmore.